We all know how the saying goes, but once you shed those dark winter layers, is your wardrobe prepared to fête the first flowers of spring? In case it isn’t, here are some colorful (and water-resistant) ways to prep your closet for the upcoming season. 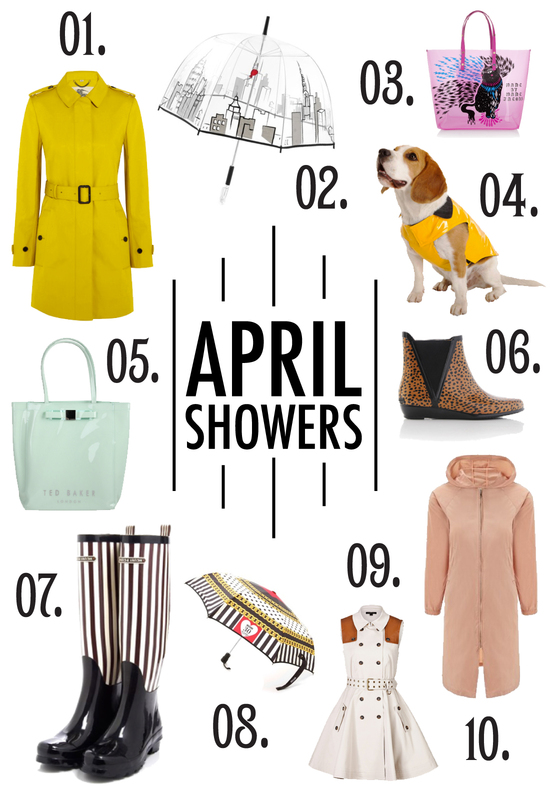 Nothing quite like a statement coat like these ones from Burberry and Charles Anastase to give your outfits a pop of color, and fun rain boots from Henri Bendel and Loeffler Randall easily add a little pep to your step. No one likes getting soaked—especially dogs—so make sure to cover up your favorite pooch before heading out on a rainy walk in a jacket like this bright yellow slicker from Barneys. And if you’re the type that’s vehemently opposed to any sort of rain gear on your body, an umbrella in a bold print, like these picks from Felix Ray and Moschino, may suit your style.